But Minister Anne Berner does not yet want to reveal conclusions in her projected Arctic Rail initiative. Expectations were sky-high as the Finnish Minister of Transportation and Communication took the stage in today’s Kirkenes Conference. Berner has raised a series of visionary Arctic projects, among them a railway line from northern Finland to the Norwegian Arctic coast. 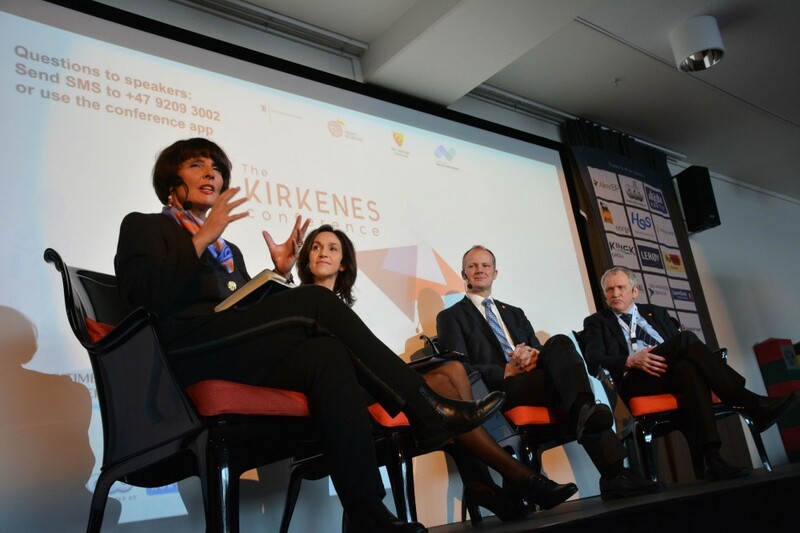 Kirkenes is one of the possible end stations in Berner’s rail project, and the local conference audience was eager to hear that this is the place preferred by the Finns. However, Berner declined to comment. But she was very clear that railway, and no other transport communication, remains the key thing in the Finnish Arctic plans. Berner’s visit to Kirkenes comes just a week ahead of the Finnish Transport Agency’s submission of a new report on Arctic infrastructure. The report is expected to prepare the ground for the development of the Arctic Rail and also outline preferred railway routes between Finland and Norway. The Finnish minister confirms to the Barents Observer that she will get the report on 28th February, and that she shortly later will present it to the public. In her presentation made in Kirkenes today, she repeated her government’s ambition to turn Finland into a key Arctic logistics hub. «Finland has made a decision that we want to see ourselves as a hub in transport of people and goods, and that we can be a connecting point in the Arctic between Asia and Europe,» Berner said. She highlighted that the projected railway line would be a unique connection between the Arctic Ocean and Central Europe, from the Norwegian Arctic coast - via Finland - and all the way to Berlin. «This is a vision which we are strongly committed to and that we do want to explore», Berner underlined. It is Finland which is running the process and Berner is the one in the driver’s seat. However, the country will not be able to reach its Arctic ambitions without support from neighbouring Norway. Norwegian Minister of Transport Ketil Solvik-Olsen agrees that Norway ultimately has the final say, but also highlights that the countries have joint interest in cooperation. «On the contrary, we have to develop cooperation in a way which makes both parts benefit,» he underlines. «In the longer term, the results are much better when the countries have joint interests, […] and the most important is that we manage to agree on investments which help build the Arctic region. He also calls on stakeholders in northern Norway to join efforts in developing the region. He believes the new Norwegian Arctic region, the merged Troms and Finnmark, could play a positive role.